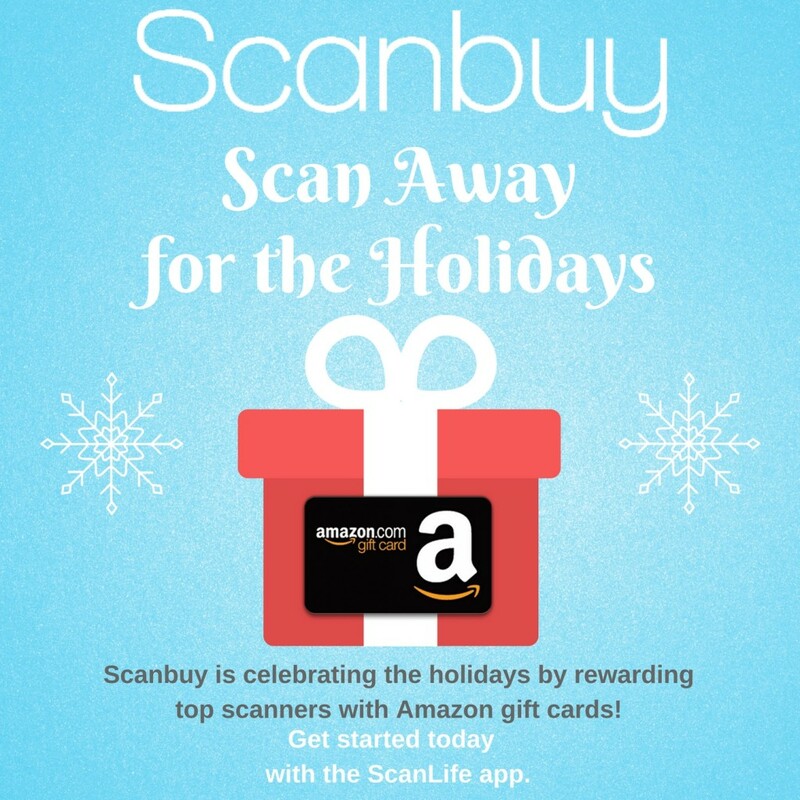 To celebrate the holiday season, Scanbuy is giving away prizes to the top holiday scanners. Every 7 days in December, we will reward the top scanner for the time period with a $25 Amazon Gift Card. At the end of the month, the top scanner for the entire month of December will also receive a $50 Amazon Gift Card! 1) Get the latest version of the ScanLife app for iOS or Android. 2) Connect your ScanLife app with your Facebook account by clicking on the icon on the top left corner of your app and clicking CONNECT WITH FACEBOOK. 3) Scan as many product barcodes or QR Codes as possible from December 1, 2017 to December 31, 2017 for a chance to win gift cards. 1. Eligibility: Scan Away for the Holidays (the “Promotion”) is open to ScanLife and Code Scanner app users in the U.S. who are at least eighteen (18) years old at the time of entry. Employees of Scanbuy, Inc. (“Main Sponsor”) and its affiliate companies, suppliers as well as the immediate family (spouse, parents, siblings and children) and household members of each such employee are not eligible. Subject to all applicable federal, state, and local laws and regulations. Void where prohibited. Participation constitutes entrant’s full and unconditional agreement to these Official Rules and Main Sponsor’s and Administrator’s decisions, which are final and binding in all matters related to the Promotion. Winning a prize is contingent upon fulfilling all requirements set forth herein. The Promotion consists of a contest (the “Contest”). 2. Timing: The Promotion begins on December 1, 2017 at 12:00 a.m. Eastern Time (“ET”) and ends on December 31, 2017 at 11:59 p.m. Eastern Time (“ET”) (the “Promotion Period”). Administrator may, in its sole discretion, modify, amend or revise the Promotion Period. Please be sure to check this page periodically for updates to the Promotion Period; if Administrator makes changes to the Promotion Period the “Effective Date” will be changed and Administrator, in its sole discretion, may provide additional forms of notifications of such changes. Your continued participation in the Promotion following the posting of such changes shall constitute your consent to such changes. Administrator’s computer is the official time keeping device for this Promotion. 3. How to Enter: During the Promotion Period, open the ScanLife application on your mobile device. Connect the application to your Facebook to ensure we can contact you if you are a winner. Participants in the Promotion will scan any product barcode (1d) or QR codes (2d) as many times as possible during the Promotion Period. The participant with the highest total of qualifying mobile barcode scans during the 7 day promotion period will be named a winner. In addition, the participant with the highest total qualifying mobile barcode scans for the entire month of December will be named a winner. Limit: Main Sponsor will name at most five (5) winners for the duration of the Promotion Period. Each participant is eligible to receive one (1) Sweepstakes entry during the Promotion Period and to receive two (2) Sweepstakes Prizes. Any attempt by any entrant to obtain more than the stated number of entries by using multiple/different identities, registrations and logins, or any other methods will void that entrant’s entries and that entrant may be disqualified. Use of any automated system to participate is prohibited and will result in disqualification. Main Sponsor is not responsible for lost, late, incomplete, invalid, unintelligible or misdirected registrations, which will be disqualified. In the event of a dispute as to any registration or play, the authorized account holder of the email address used to register will be deemed to be the registrant or player. The “authorized account holder” is the natural person assigned an email address by an Internet access provider, online service provider or other organization responsible for assigning email addresses for the domain associated with the submitted address. 4. Sweepstakes Drawing: Administrator will choose the winners from the eligible entrants. Their decisions as to the administration and operation of the Promotion and the selection of potential winners are final and binding in all matters related to the Promotion. Sweepstakes: Administrator will choose winners from the eligible entrants based on the participant with the highest total number of qualifying mobile codes scanned during the Promotion Period. Administrator’s decision as to the administration and operation of the Promotion and the selection of a winner is final and binding in all matters related to the Promotion. 6. Verification of Potential Winners: Potential winners must continue to comply with all terms and conditions of these Official Rules, and winning is contingent upon fulfilling all requirements. The winner will be notified by email and required to reply to the email within twenty-four (24) hours of the time notice or attempted notice is sent, in order to claim his/her prize (if applicable). If the winner cannot be contacted, fails to reply within the required time period, or the prize is returned as undeliverable, such winner forfeits the prize. In the event that the winner is disqualified for any reason, Main Sponsor will award the applicable Prize to an alternate eligible entrant based on the entrant with the next highest total number of qualifying mobile codes scanned during the Promotion Period. All alternate winners are subject to all requirements set forth in these Official Rules. Only three (3) alternate winners will be selected, after which the Prize will remain un-awarded. 7. Prizes: Sweepstakes Prize: The winners or top scanners during the 7 day time periods will receive a $25 Amazon Gift Card. Approximate Retail Value (“ARV”) of the Prize: $25.00. The grand prize winner or the top scanner in the month of December will receive a $50 Amazon Gift Card. Approximate Retail Value (“ARV”) of the Prize: $50.00. Actual value may vary based on the then prevailing Fair Market Value. Winner will not receive the difference between actual and approximate retail value. Odds of winning any of the Sweepstakes Prizes depends upon the number of eligible entries received during the Promotion Period and the total number of qualifying mobile codes scanned by eligible entrants during the Promotion Period. No refund or compensation will be made by Main Sponsor in the event that the Prize is defective or non-functioning; Prize Winner’s sole remedy will be through the manufacturer’s warranty. All expenses and costs associated with effectuating the manufacturer’s warranty will be the sole responsibility of Prize Winner. Winner is solely responsible for his/her own conduct while accepting the prize and agrees to comply with all applicable laws and regulations pertaining to use and enjoyment of the prize, including, but not limited to, state and federal tax requirements. Main Sponsor will not replace any lost, mutilated, or stolen prizes.